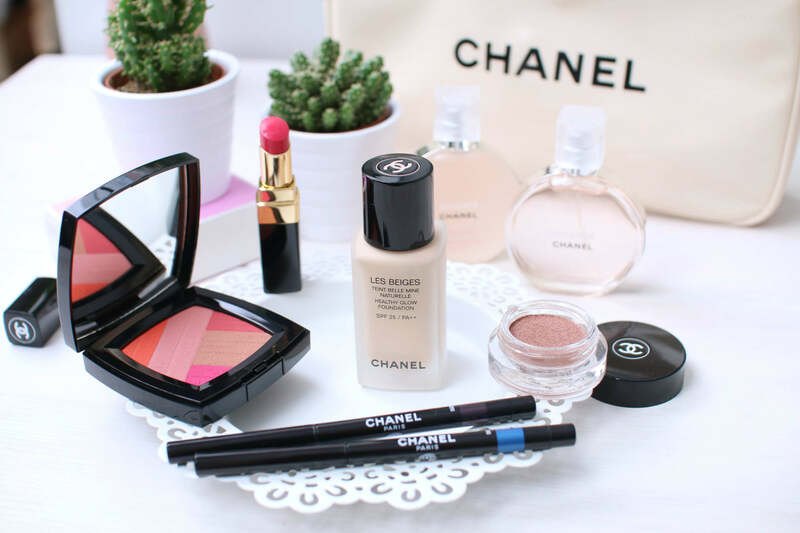 My Instagram and blog feeds have been inundated with reviews of Chanel’s latest foundation release, and I suppose it gave me the kick in the right direction that I needed. I have been trying out this bottle of Chanel Les Beiges for the past few months, and whilst enjoying every moment, forgot to actually take pictures and write down my feelings on it. And of course, I didn’t really want to review it alone, so here are more first looks at the newest Chanel L.A Sunrise Collection. With inspiration from the tones in the L.A Sunrise sky, the products incorporate deep blues, burnt oranges and blush pinks. The Varnish in Sunrise Trip is a stunning electric blue, almost black, that changes colour depending on the light, whilst the ribboned and embossed Sunrise Ribbon blush mixes golden bronzes with vibrant pinks and oranges to create a burst of brights. But of course, the main event goes to Chanel Les Beiges, the newest foundation to the Chanel line up and one of my favourite products of the past few months! I prefer to pump two amounts of Chanel Les Beiges (No.20) onto the back of my hand before using a brush to buff it into my moisturised skin. The coverage is medium and buildable and certainly not for those who enjoy very lightweight bases. But for myself, this is the sort of foundation I always veer towards. Something that can make my skin look flawless, bright and perfected. The shades stay within the neutral, beige spectrum – neither yellow or pink toned so that the formulation is more likely to suit more skin tones. I have found that it has great staying power throughout the day, it doesn’t dry my skin and whilst it is neither extremely dewy or matte, it provides a skin like and natural look to the skin. Over a luminising moisturiser or priming base, it will allow even more light and luminosity to be created, and this is how I love to wear it. After applying Chanel Les Beiges, I powdered and bronzed my face before applying the new Sunkiss Ribbon Blush. With a stunning embossed ribbon effect to the pan, the product is almost too stunning to ruin, yet does offer a number of alternative blush shades for use. The user could select one of the colours to apply more heavily or sweep their brush around the whole pan to pick up a mixture of Sunrise shades, which is how I prefer to use it. The mixture of the golden bronze with the blush pink, in addition to the vibrancy of the orange and magenta creates a warm sunlit flush. I fancied trying out the eye products together, with a pop of colour to the upper lid with the Waterproof Eyeliner. The Illusion D’Ombre Luminous Eyeshadow, in Moonlight Pink, is one of the best eye products to grace my collection for a very long time. I have found myself reaching for this pot every other day, which for a girl with too many eyeshadows, this says a lot! With a blending brush, such as the Mac 217, or a Chanel Large Tapered blending brush perhaps, I dip into the pot and apply straight into the crease of my eyelid. The shade is a wonderful beige toned pink that warms up the eyes and creates a natural shadow. Some days I will also apply it all over the lid, as I have in the images, and the pigments in the shadow just catch the light without being too garish. It is so natural and luminous and wonderful to apply. And to the upper lash line I added the Waterproof Stylo in Fervent Blue, for an electric blue pop. The consistency of the pencil is smooth and easy to apply, just gliding along the lash line without dragging and offering vibrant colour immediately. To the lower lash line, I used the Waterproof Stylo in Purple Choc with a deep purple shade that I thought would define the eyes without being too heavy. I elongated the line to my inner tearducts to make my eyes appear larger and wider and joined the end of the line to the vibrant blue at the outer edge. The new L.A Sunrise collection is truly a dream and I feel with the inclusion of the new Les Beiges, is going to be a best-selling collection for Chanel. Currently this is one of two foundations that I am absolutely smitten with. Not only does the bottle look beautiful and prestigious, but the product inside is a wonderful inclusion into Chanel’s range of bases. The Chance Eau Vive Hair Mist is a great addition to their famous fragrance range, with the notes being more fruity and zesty than previous Chanel Chance scents. It has notes of blood orange and grapefruit, but maintains that key, Chanel recognisable finish. And the Rouge Coco Shine lipstick in Energy is a magenta pink that I always needed in my collection. It has made its way into my handbag purse because I love how bright, hydrating and wonderful it is with my skin tone. Tempted by Chanel Les Beiges? I think if you’re a fan of Armani’s Luminous Silk, Nars Sheer Glow or Charlotte Tilbury’s Magic Foundation, you might find you’re a big fan of this!